Home Busch Gardens Tampa Our 2019 Busch Gardens Tampa Park Guide is Live! Busch Gardens Tampa, 2019 Park Guide & Review. Days Needed in the Park. Will I Enjoy Busch Gardens, is it the right park for me? Busch Gardens Tampa (BGT), (Also known as Busch Gardens Africa) is an African-based animal theme park located in Tampa, Florida. The park currently features 8 roller coasters with number 9 set to open in 2019. Busch Gardens Tampa opened on March 31, 1959 as marketing for Anheuser Busch. The park featured a hospitality house beer-tasting facility with a bird garden. In 1965, the park opened the Serengeti Plains, which allowed African wildlife to roam free. The big draw was the Stairway to the Stars, an escalator that took guests to the roof of the brewery, offering excellent views. Busch Gardens later added more attractions, started to charge admission, and eventually become known for the thrill rides and roller coasters we see today. The park is now owned and operated by SeaWorld Parks & Entertainment Inc.
-Cheetah Hunt and Cobra’s Curse will have the longest lines throughout the day, try to get to the park before opening so you can head to these two first. -If you are in the park all day, we recommend one dining pass per two people in your group. This pass entitles you to an entree, side, and drink once per hour. You’ll save money and there are plenty of food options throughout the park to use the plan. -Bags aren’t allowed on some rides, so try to only bring what fits in a zippered pocket to avoid locker lines and fees. -Use the Sky Ride and the Train if you need to get to other sections of the park. You’ll see animals from viewpoints that you cannot get to from the pathways. -Stay until closing if you are looking for short lines, you'll find most people have already left within the last hour of park operation, making those last 30 minutes the best time to re-ride your favorite coaster over and over again. Days needed at Busch Gardens: 1-2 Days. While a thrill seeker will be able to ride each major thrill attraction in about 6 hours, there’s a lot more to enjoy in this park. From great shows to the many animal exhibits, we recommend taking it slow and going for two days instead of packing it all into one busy day. There’s also a water park across the street, and plenty to do in St. Petersburg or Tampa! Busch Gardens also has a nice selection of beer and plenty of places to sit and enjoy the scenery. Plus, visitors get free beer samples through 2019! For Low Crowd Levels be sure to get early to the park or be prepared to stay until closing. The middle of the day will be busiest. January, February, weekdays in October, and early November are going to have the predicted lowest crowd levels at Busch Gardens. Tuesday-Thursday are the least crowded days at the park historically. Halloween and the “Howl-o-Scream” event will bring large crowd levels during select nights in September and October. Getting to the park early can avoid the crowds on these days, as the park begins to get busy around 2:00pm to 3:00pm during these nighttime events. During concerts at the park, you can expect high crowd levels throughout the day. For Shows & Events visit the park during one of the many festivals at the park. BGT offers concert series, beer festivals, Christmas celebrations, and more throughout the year. Usually, a visit during peak-season is required to take part in special events. Real Music Real Masters: Monday-Saturday, January 7-March 16. The longest-running concert series at Busch Gardens Tampa Bay returns in January with incredible live music spanning from the 1950s to today, plus all-new entertainment. Food & Wine Festival: Weekends, March 16-April 28. A world of taste awaits at the fifth annual Food & Wine Fest. Wine, beer, cocktails, and food have an additional charge, while the music acts during the fest are free with park admission. Sesame Street Kids' Weekends: Weekends, May 4-May 19 & Weekends in October. Celebrate Spring and then Halloween with your favorite Sesame Street Characters. Summer Nights: May 31-August 10. Explore the park after dark with extended park hours every night. Dance the night away at themed party zones throughout the park and take on Florida’s top thrill rides in the dark. Independence Day Fireworks: July 4. Live entertainment and fireworks light up the night on the Fourth of July. Bier Fest: August 24-September 15. This festival blends the local Tampa Bay craft scene with time-honored traditions to create a unique food and beer celebration. Enjoy live entertainment and contemporary fare that pays homage to a traditional Oktoberfest with a modern spin. Howl-o-Scream: Select nights in September-October. Howl-o-Scream is a yearly Halloween fright fest. This adult-targeted event transforms Busch Gardens into a late-night party with haunted houses, scare zones and a live show. Christmas Town: Select days in November-December. Celebrate the Holidays with Santa, Rudolph & more while enjoying the Christmas environment. New Year's Celebration: December 31. Ring in the New Year with music, fireworks, and thrill rides for the whole family. Busch Gardens has plenty of quick-service restaurants that feature good options. We recommend the Zambia Smokehouse near Sheikra’s signature splash-down pool or taking it easy at the Serengeti Overlook Restaurant. We also recommended getting one meal plan per every two people in your group. You’ll save a ton of money and the food options on the plan are above average. Busch Gardens is known for its large animal habitats and thrill rides. There is an average amount of tree coverage and plenty of places to sit and relax in the shade or air conditioning. There’s a lot for the thrill seeker, a lot for the zoo lover, and a lot for young kids. If you do not fit any of those categories, you may have less to enjoy while at the park. Busch Gardens lacks indoor rides, and over the years we’ve found it has lost a number of excellent full-time shows and replaced them with seasonal festivals, concerts, and limited-offerings. Busch Gardens offers packages through an online booking service. We recommend staying at one of these hotels with transportation to and from the park. You’ll save on parking at the park and this also allows you to bundle your daily tickets with the hotel stay for the best deal on the entrance fee. Cheetah Hunt: We rank Cheetah Hunt in the 85th Percentile of coasters worldwide. Cheetah Hunt is a family coaster with an inversion thrown in, but it's still not a ride that everyone will enjoy. The inversion might scare the little ones away, and the speed and launches of the ride might turn off a much older generation that feels it's too intense. Multiple launches, elevation changes, trenches, and scenery along the path of the ride make for one awesome coaster. The river section is one of the most enjoying sections of coaster ever! Over the years we've found Cheetah Hunt to get a little more shaky in certain rows, but sitting in the front takes care of this rattle. Read our full review and score of Cheetah Hunt here. Cobra's Curse: Cobra's Curse is a great ride for the whole family. Don't worry if you usually get sick on spinning rides, this one doesn't spin enough to cause any trouble. It's smooth and has a lot of fun elements to it that make it a must ride for your family. Kumba: Kumba is one of the first Bolliger & Mabillard coasters ever built, it's over 25 years old! B&M is known for their smooth rides and high-capacity coasters. Kumba has aged quite well, but it has gotten a little rough over the years. Sit in the front seat for the best experience, this coaster still is regarded as one of the best in the world. 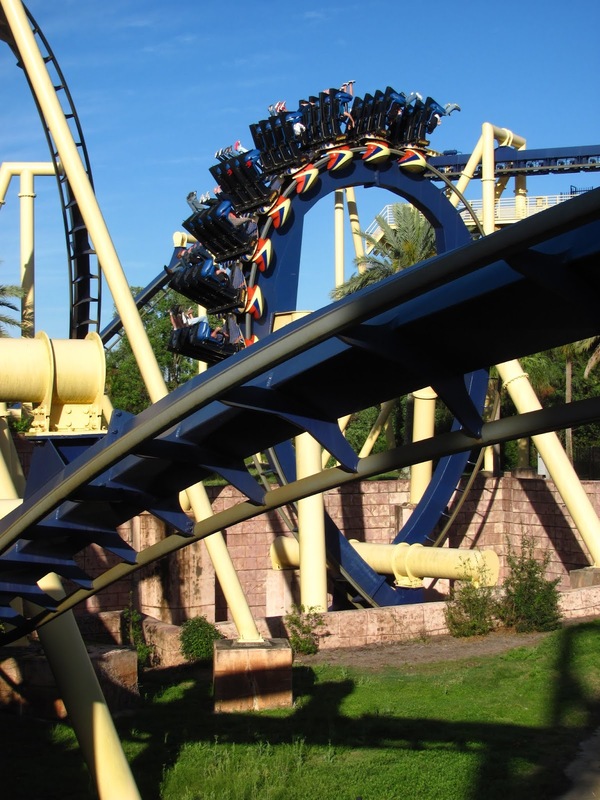 Montu: Montu is one of the best coasters in the world and consistently ranks high among enthusiasts! Made by the same company as Kumba, this inverted coaster features strong elements, is very smooth, and has a long layout. There's many low-to-ground elements and trenches that the coaster dives into on many occasions. 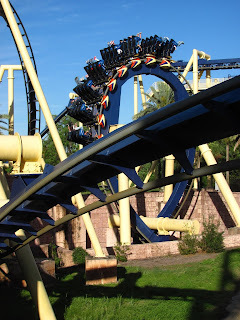 Montu is a must-ride and is the best coaster in the park! Sand Serpent: This wild mouse roller coaster is smooth but can be a bit jerky from side to side, as most wild mouse rides are meant to be. If you're looking for another coaster the whole family can ride and have a laugh about, this is the one. Scorpion: Scorpion is a ride that many people skip while at the park. It is an older model roller coaster (1980), but it isn't as rough as many people believe it to be. It has some moments of discomfort but nothing out of the ordinary. Many kids ride this as their first upside down coaster, as you only need to be 3' 6" tall to ride. Sheikra: Sheikra is the first dive machine to go upside down. This smooth coaster features an exciting drop, high speeds, and it's fun to watch by non-riding spectators as the train splashes through a pool of water. It's on the shorter side, but worth a ride every visit to Busch Gardens. Congo River Rapids: This is a fun ride for the whole family, about half of the boat will get soaked, and there are no big drops on this ride. In the colder weather when the waterfalls are off, there is still a chance you may get soaked. Falcon's Fury: This drop tower has tilting seats that make the ride that much scarier. As if being 335-feet in the air wasn't enough, how about falling while facing straight towards the ground. Serengeti Express: Definitely take this train ride to get glimpses of the animals that you can't get from anywhere else! A great way to get around the park as well with multiple stops. Stay on board or hop off at your leisure. Skyride: Another ride to get some incredible views of the animals from. Not for those with a fear of height. A great transportation device to use around the park. Stanley Falls Flume: You will not get as wet on this log flume ride as the River Rapids, but it does feature a couple small drops. Will I enjoy Busch Gardens? Thrill Seeker: 9/10 Most of the roller coasters at Busch Gardens Tampa are custom for the park and one of a kind. Enthusiasts from all over flock to the park for some of the most highly-regarded coasters in the world. Montu, Sheikra, Kumba, and Cheetah Hunt. Young Kids: 8/10 A lot of walking for children, but a lot to do too. Educational animal segments are located around the park and plenty of rides for the younger kids that can’t fit on the coasters yet are available. Older-Generation: 6/10 With a limited amount of full-season show offerings, and not many low-motion/slow-moving rides like you would find at a Disney park, we don’t think that this is the best park for an older group to visit. Unless you are just going to view the animals, in which case we would recommend the zoo instead to save money. If you do go, ride the train! Non-Thrill Rider: 8/10 There’s seasonal shows, animal exhibits, the sky ride, and the train. Plus a nice selection of food and beer. The animal exhibits feature open spaces for the animals in most areas, and many live educational segments from animal techs. Transit/Walkability: 9/10 Busch Gardens Tampa has a sky ride as well as a train that take you to different sections of the park. With multiple boarding locations scattered around, there’s no need to have to walk to every location throughout the day. Although you will still do a lot of walking. For wait times of popular roller coasters, rides and attractions, we recommend the official mobile app. You can check the app while you’re in the park and avoid some of the longer lines. Do you have any questions for our experts? Ask below and we are happy to help, usually replying within the day! Does Busch Gardens still have free beer? Busch Gardens is celebrating the year of beer, offering two complimentary samples of beer to every guest over 21. Grab your free beer at the Garden Gate Cafe or the Serengeti Overlook Pub. Do I need a skip the line pass for Busch Gardens if I’m only there for one day this summer? Depending on when you visit, a “Quick Queue” may be recommended. You’ll be able to do all the major rides in a day without a Quick Queue, but you may not have time to see the great lineup of animals and shows that the park offers. Are the rides smooth? Most of the rides are very smooth here, we recommend reading our reviews above of each ride to get a better idea of which ones to skip if you do not do well on rough rides. BUT WHERE do I get free beer!!!! Beer is back for 2019! Hello, Do you know how long the train ride is? Why do you recommend All Day Dining for 1 of every 2 in your group? How does this work? The dining plan allows you to eat once every hour and gives you quite a bit of food, share each meal and have a 3-4 meals instead of just eating once or twice during the day. Hit the dining places during the off hours so you aren’t waiting in line. I’ve actually shared one meal plan with four people before and we were all plenty full at the end of the day. Plus you get to sample more of the food at the park; try the BBQ near Sheikra, my personal favourite. The site says it is strictly prohibited. Is it that they just don't care or check? Never ran into issue and it may be a new rule, I believe it is the same system as before.